We crowned a BRAND NEW WCW World Heavyweight Champion. It was a triple threat match with Booker T defending the title against Eddie Guerrero and Chris Jericho. Booker T had been the champion ever since Bash At The Beach but his reign came to an end when Booker hit his finisher on Eddie. Jericho threw Booker out of the ring to steal the pin for himself and leave Starrcade as the new WCW Champion. 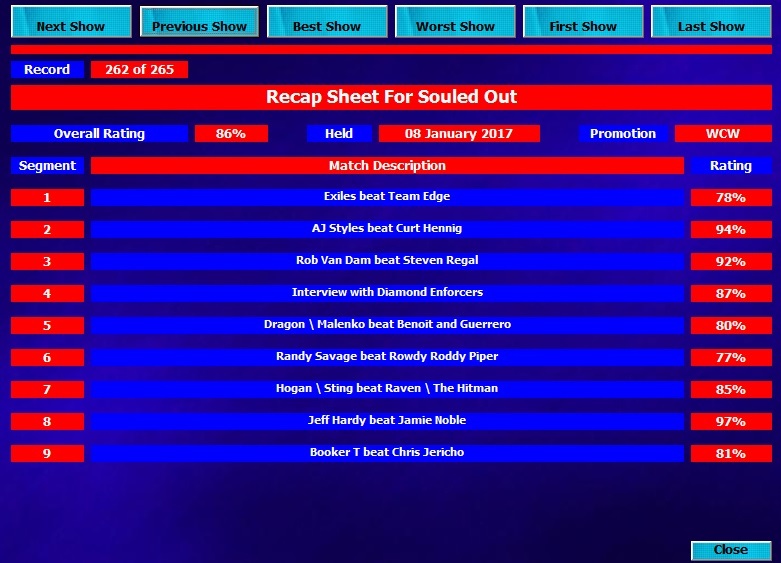 Booker T is owed a rematch and would get it at Souled Out. There were another title change that took place. Ultimo Dragon and Dean Malenko won a triple threat tag team match against the champions DDP and Arn Anderson and against Scott Steiner and Bill Goldberg. Sting battled Bret Hart, Hogan battled Raven and the stole was stolen by Jamie Noble and Jeff Hardy in a match for the Cruiserweight title. So now we’re in the year 2001 and we’ve got quite a show in store for you…. The Legion of Doom are reunited! Yes, I was able to steal Hawk from the WWF to complete the tag team. Animal might be leaving soon because he’s very unhappy. That reflected on the rating a little. However, I do want to get this tag team rocking and rolling again for one final time before he does. They were in the pre-show but I do have something special in line for them at SuperBrawl, so don’t worry. They teamed with Edge and Christian to lose to the Exiles. Shane Helms has been getting really over as of late, which has been awesome because it took him a while to get going. The heels win and the Exiles still look strong coming off this eight man tag team match. Very good opener to the show. AJ performed well as usual. This was the last match in their feud with AJ retaining the TV title once more. I was VERY tempted to put the belt on Curt but I instead kept it on AJ. Both of these men are really over and the fact that they are doing so well sits well with me! 94% overall rating! I’m very happy with this! Maybe Regal should have went over because he was more over than RVD, but I gave it to Van Dam. This feuds helped both of these wrestlers out anyway. It got a 92% rating and the feud ended with a bang. Since they weren’t on the show, I had DDP and Arn cut a promo. To give a bit of background. DDP and Arn lost the titles at Starrcade and had their rematch on Nitro. Their rematch was interrupted by Eddie Guerrero and Chris Benoit, who cost DDP and Arn the titles. It led to a number one contendership match between Eddie/Benoit and DDP/Arn for a tag title match at Souled Out. Ultimo and Dean made a botched interference which led to Eddie and Benoit winning. DDP is basically saying here that they don’t care who wins as the Diamond Enforcers will regain the tag titles. They said that they will be watching on intently. Eddie and Benoit’s morale is really low at the moment, so I think that hindered the match a little. Benoit and Dragon have had some great matches on TV and the Dragon vs Eddie feud from the year before did REALLY good ratings if I remember correctly. To see them just get an 80% was kind of disappointing. The Diamond Enforcers came out to attack Dragon and Dean after the match. They made it clear that they were gonna win the tag titles. By the way, that match will take place at SuperBrawl. I probably should have expected a 77% rating for this. Piper and Savage are quite old at this point in their careers. They got the worst rating of the show. However, they both gained overness from the feud ending. Both of them are still really over anyway so I’m not to bothered. Savage ended up getting revenge on Piper for costing him his match with Benoit at Starrcade. Hogan and Sting have decided to reunite to tackle Bret Hart and Raven together. These three all put together a great rating. The crowd reaction was really high. I think it might have been 100% for crowd reaction but I can’t remember. The match quality wasn’t so great, probably due to Hogan. However, an 85% overall is a solid rating. These four always seem to deliver in the ratings. Anyway, it spices things up to put them in a tag together. Raven always seems to get the win over Hogan so it was nice to see to good guys get a win. Overall, a thumbs up. At Starrcade, I said that the wrong man went over in the Cruiserweight title match. Here, I think I’ve rectified that wrong. Jamie was kind of losing steam as champion while Jeff was just insanely over. Therefore, I put the belt on Jeff. These two stole the show again. It did a better rating than last time which was incredible. I feel that I keep hot-shotting the title nowadays. Sometimes, it’s just out of my hands with suspensions and stuff. However, I do feel I’ve made the right call and I feel that Jeff should be champion for a while. 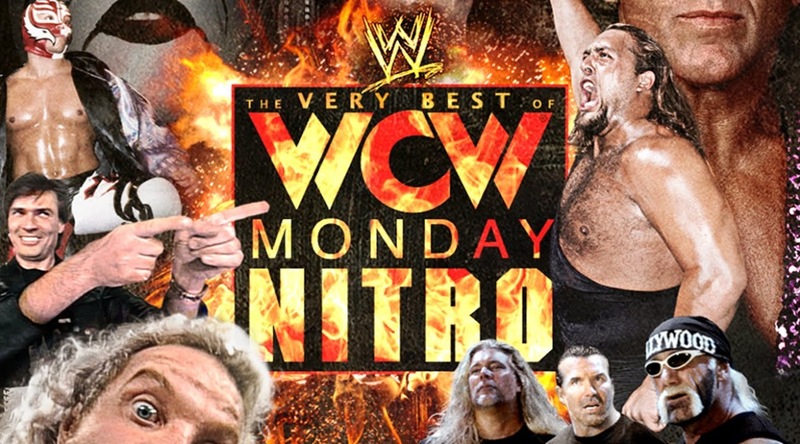 This entry was posted in EWR, Extreme Warfare Revenge, WCW and tagged 1998, 2001, Bash At The Beach, Booker T, Bret Hart, Chris Jericho, EWR, Hollywood Hogan, Injury, JEFF JARRETT, nWo, raven, Souled Out, Sting, Vince Russo. Bookmark the permalink.